Version 6 of MPAS-Albany Land Ice (MALI) introduces a new variable-resolution land ice model on unstructured grids. Researchers at Los Alamos National Laboratory, Sandia National Laboratories and the National Center for Atmosphere Research created the MPAS-Albany Land Ice (MALI) model, which will enable high-fidelity, high-resolution simulation of ice sheet evolution in the Energy Exascale Earth System Model (E3SM). MALI utilizes variable-resolution, unstructured Voronoi grids to provide high resolution in dynamic regions, like ice streams and ice shelves, and lower resolution at the ice sheet center where high resolution is not needed, thereby applying computational power more efficiently. By solving a more complete description of ice motion, MALI is more accurate than most existing large-scale, high-resolution, whole-ice-sheet models. MALI achieves computational efficiency by using a model grid that focuses resolution in the most important geographic regions and by taking advantage of advanced numerical and computational methods developed by DOE scientists. During the past decade, numerical ice sheet models (ISMs) have undergone a renaissance relative to their predecessors. The Fourth Assessment Report of the Intergovernmental Panel on Climate Change (IPCC AR4, 2007) pointed to deficiencies in ISMs of the time as being the single largest shortcoming with respect to the scientific community’s ability to project future sea level rise stemming from ice sheets. The IPCC AR5 (2013) argues that the sea level contribution from Antarctica is the single largest source of uncertainty when trying to assess the likelihood and range of future sea level rise. While model maturation efforts over the past decade represent significant steps forward, next-generation ISMs continue to confront new challenges – like spatial resolution of ~1 km necessary in highly dynamic regions – that require them to be both accurate and computationally efficient. MPAS-Albany Land Ice (MALI) v6.0 is a new, high-fidelity, variable-resolution ice sheet model for use on high-performance computing architectures and coupled to the U.S. Department of Energy's new Energy Exascale Earth System Model (E3SM, version 1). MALI is built using the Model for Prediction Across Scales (MPAS) framework and the Albany multi-physics code base. Mass, energy, and momentum conservation formulations for the model are verified using analytical solutions and a range of community benchmark experiments. When employing MALI’s variable resolution capability, the same solution accuracy can be achieved for approximately half the number of unknowns relative to using a uniform, high-resolution model. 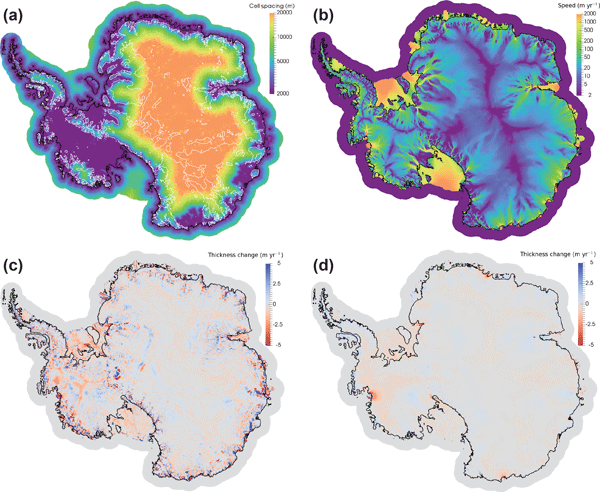 Robust and scalable solvers allow for realistic, multi-century simulations of Antarctic ice sheet evolution at unprecedented spatial resolution; the calculation solves for ~32 million unknowns on 6400 processors with average model throughput of ~120 simulated years per wall clock day. Model fidelity, performance, and reliability under offline, extreme climate forcing experiments lend confidence in MALI’s ability to perform robustly as a coupled component of E3SM. Currently, very few ice sheet models are dynamically coupled to atmospheric and ocean dynamics within Earth system models, a goal that MALI developers are currently pursuing. These improvements will eventually make MALI suitable for simulations as a fully-coupled component of E3SM, which will be used to simulate the potential impacts of ice sheets on future sea level and to better understand how ice sheets interact with the global climate system. Hoffman, M, M Perego, S Price, W Lipscomb, T Zhang, D Jacobsen, I Tezaur, A Salinger, R Tuminaro, and L Bertagna. 2018. "MPAS-Albany Land Ice (MALI): A Variable-Resolution Ice Sheet Model for Earth System Modeling Using Voronoi Grids." Geoscientific Model Development 11(9): 3747-3780, doi:10.5194/gmd-11-3747-2018.